As Baird states in this letter, his messages home had become less frequent due to his stints on picket duty. 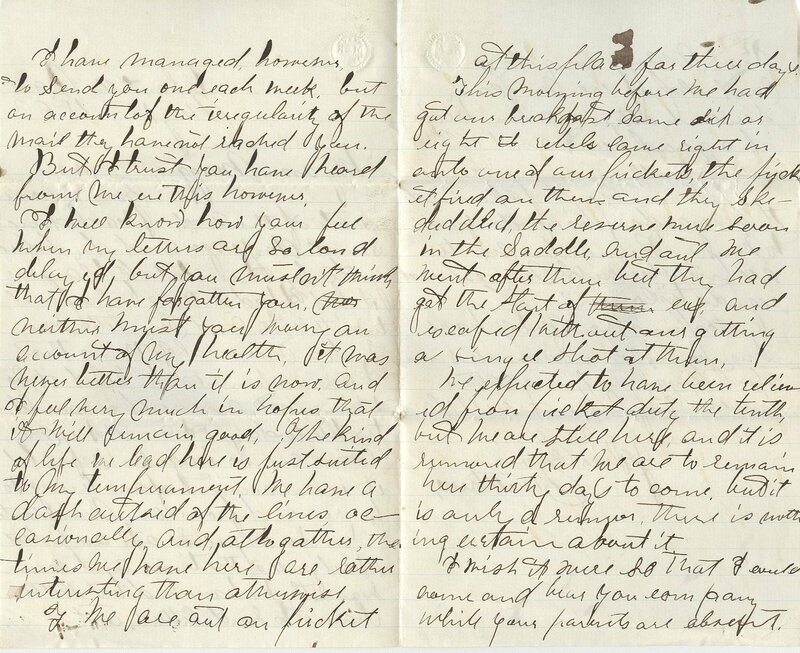 The letter becomes difficult to read by the end and several of you were able to help us with the transcription. Thank you Debra Wisniewski! Can you decipher the missing words? Your welcome note of the 2nd reached me several days ago, and day before yesterday I undertook to answer it, but I had nothing but a pencil to write with and my letter was such a miserable thing, that I was ashamed to send it, So I have not answered your letter till to-day. I am sorry my letters are so irregular now, but it is on account of our being so far removed from any Mail route. You see we are out on picket nearly all of the time, and consequently we have had but little chance to send letters out. I have managed, however, to Send you one each week, but on account of the irregularity of the mail they have not reached you. But I trust you have heard from me ere this however. I well know how you feel when my letters are So long delayed, but you mustn’t think that I have forgotten you, neither must you worry on account of my health, it was never better than it is now. And I feel very much in hopes that it will remain good. The kind of life we lead here is just suited to my temperament. We have a dash outside of the lines, occasionally, and, altogether, the times we have here are rather interesting than otherwise. We are out on picket at this place for three days. This morning before we had got our breakfast, Some six or eight rebels came right in onto one of our pickets, the picket fired on them and they skedaddled, the reserve were soon in the Saddle, and out we went after them but they had got the start of us and escaped without our getting a single shot at them. We expected to have been relieved from picket duty the tenth, but we are still here, and it is rumored that we are to remain here thirty days to come, but it is only a rumor, there is nothing certain about it. I wish it were so that I come home and bear you company while you[r] parents are absent. But many long days must elapse ere we can see each other again. Keep up a good heart and all will be well. I now Sit down to write you a few lines as I promised in my last letter, and to enclose to you fifteen dollars in United States currency. I received $28.93 the payment and wanted to send you more but I wanted to get a few necessary articles, and for this reason retain the balance we were paid up to the 31st Oct. only, but as we expect, in a few days to be paid up to the 1st Jan. I think I shall then be able to Send you $22 more. You remember when I left home, that Robert let me have two dollars, and you will pay to him two dollars of this I send you now, and oblige me. I think he has waited long enough for it and tell him I am very much obliged for the loan of it. I am not very well to-day, and of course you will excuse me from writing so brief a letter, I must however, before I close, acknowledge the receipt of those beautiful verses my mother sent me, and for which I thank her very much. I have rewritten them [in] all my letters. Robert Baird was born in 1843 in Mt. Giliad, Marion County, Ohio. He was the third eldest of the Baird children after Matthew and Samuel. In the 1860 census, he is 16 and living at home in Cedar Creek, Barry County, Michigan. Robert enlisted in the cavalry on August 5th, 1864 in the same unit as his brother Samuel – Co. H, 2nd Missouri Cavalry, “Merrill Horse”. Records indicate that while in Benton Barracks, Missouri, during the fall of 1864, Robert and many others in his unit, came down with the measles. Robert was brought home and succumbed on December 4, 1864. 205 other soldiers in his unit also died as a result of the measles. Mary Baird, five years younger than her brother Robert, was born in 1848 in Mt. Giliad, Marion County, Ohio. She is 12 years old in the 1860 census and living with her parents in Cedar Creek. Her parents passed away in 1866, so she becomes difficult to track. She married Alphonse Larkin c. 1870, he was a farm laborer from the Hastings, Michigan area. They had one daughter, Lucy, who was 10 in the 1880 census and another Maggie, 12 years later. By the time the 1900 census rolls around, Mary and Alphonse are living with their 5 year old granddaughter Gladys. Mary passed away in 1904 from complications of diabetes. Alphonse (64) and his father Nathan (92) are living with Maggie (Larkin) Trumper in the 1910 census. 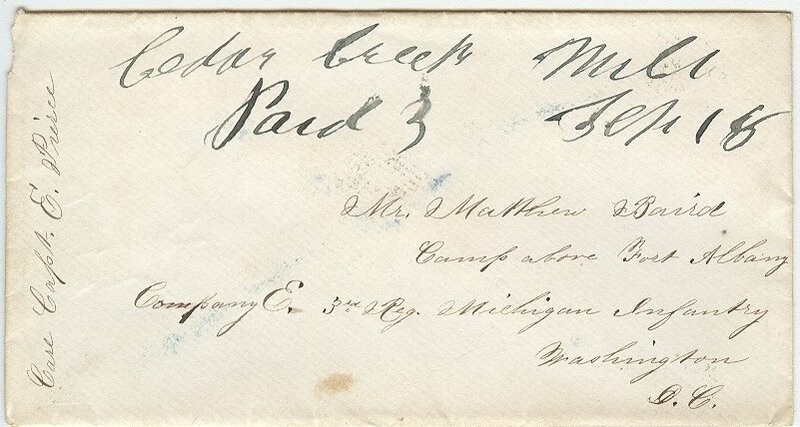 It is now nearly 4 weeks Since we came to Washington, And though I wrote you imediately after our arrival, and though I have watched each successive mail with an anxiety know only to your-Self yet I have as often been [illegible] to disappointment. I was almost sure that to-day I should certainly hear from you, but alas; the same luck attended me. Nor have I heard from home either. I guess you have all forgotten me. Well, I’m hardly worth thinking about, and of course it is no wonder then that I get no letters. I presume, however, you will all take pity on me by and by and Send me a few lines. How cheering a few lines would be to hear from home, and those we love. These long evening while gathered around the campfires, how it would make the poor Soldiers heart pound, to get some such little token of remembered love, Some Such gentle proof of unbroken affection. Ah; you little know how much the Soldier thinks of home and those he has left behind, those whom he has gone to defend. You may think too that we are given to complaining but do you not remember, when we left, how you drew from us the promises to “write often”, and assured us that our letters should be met with a hearty and speedy response, but the answers thus far have been few and far between. But I will not chide you too much. I presume you would like to hear news but indeed you will get it much more correctly from the news papers and speedier than I can give it here. In fact we don’t hear anything correctly, nothing but rumors come our way. So you must excuse the scarcity of news in this. Hoping and trusting that I shall hear from you directly, I will close this hastily written note. I am well, only tired, for we have been drilling pretty hard to-day. Baird often wrote poetry and prose in his diaries and we will publish some of these in the absence of letters and diary entries. This poem followed the June 9th date. And put my trust in Heaven. And feel they come from Heaven.